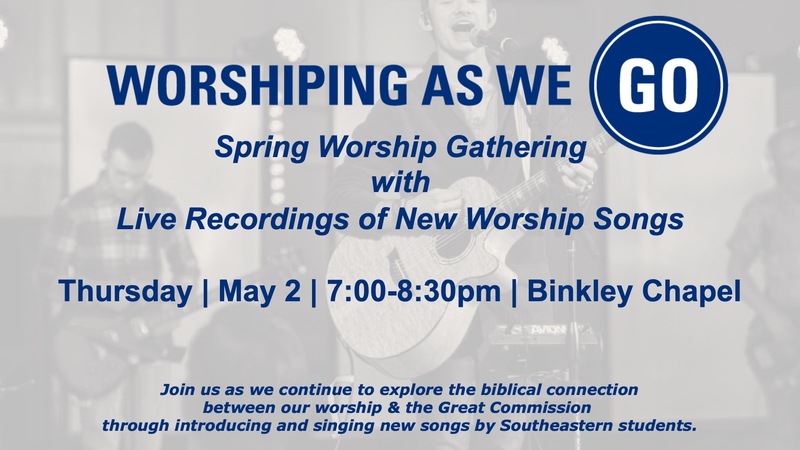 Join us Thursday evening, May 2 in Binkley Chapel for live recordings of new worship songs that help us consider the connection between the Church’s song and the Church’s mission. Worship with us through songs led by student bands and the Kingdom Choir. And help us bring new songs by Southeastern students to life, expressing the mission of Southeastern and our commitment to Worship as We Go. This event is free and open to the public. The Southeastern community and local churches are encouraged to attend. For more information, contact Dr. Joshua Waggener, Assistant Professor of Music and Christian Worship, at jwaggener@sebts.edu.